Cancer is serious stuff. Much of how we experience the subject of cancer, from education to non-profit organizations, is quite heavy. No doubt the subject matter should be serious, but when we think about the best way for the medical community to talk to people about preventative health measures, it's important to understand what is the most motivating from the perspective of the possible patient. That is, if a person is already worried or scared, the most compelling messages may not be the most serious or most scientific. 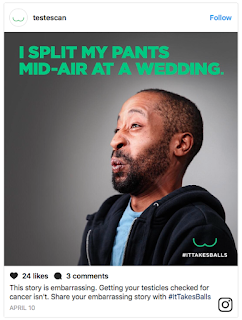 In a move by Testicular Cancer Canada, this organization uses light and humor in a brilliant campaign to urge men to get their testicles screened. They have addressed the barrier of embarrassment (really, no man wants to have his testicles fondled by a stranger...or maybe you do, but let's not go there) head-on in a perfectly relatable way, thereby removing some of the possible fear of getting checked. 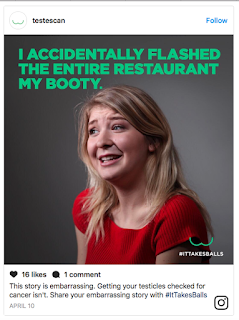 #ItTakesBalls shares some of life's most real and embarrassing moments, in order to demonstrate that there are many more embarrassing things in life other than getting your balls squeezed. 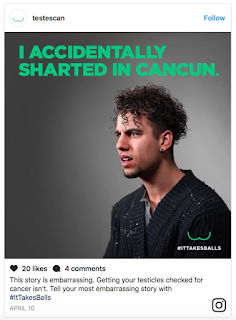 This campaign is great example of how creative messages, even in flat media, can benefit from smart CX. Funny, insightful, grounded and we hope most of all, effective.